The Spitalfields Neighbourhood Plan is likely to have a variety criteria led, site-specific and generic neighbourhood planning policies. Some policies will apply to particular circumstances, other policies will only be applicable in particular places and some policies will apply to the whole neighbourhood. The first phase of our public consultation began in April 2017 and ended recently on 31 March 2018. It will establish what the local needs and priorities are. During this period we have also begun making statistical enquiries using the official data sources. Since March the Forum Council has worked on translating the results of the public consultation into a ‘Vision Statement’ and eight 'Objectives'. Further work will then result in detailed draft policy proposals which we believe will deliver those objectives. These policy proposals will be drafted by specific working groups containing members of the Forum Council and other local people with an interest or expertise in that area. Where necessary outside expertise will be hired. These draft policies will be gathered together into a written draft plan. At this stage policy proposals which do not have a strong enough evidence base will either be rejected or the focus of last minute work. The final stage will be when we consult upon this "Pre-Submission Draft" when we recommend a draft neighbourhood plan and seek views on the package as a whole. Once the forum members have settled on a final version of their Draft Neighbourhood Plan it will then be submitted to Tower Hamlets who will organise an independent assessment of it (by the Planning Inspectorate) before having it put before both the inhabitants and the local business community of the neighbourhood area for their approval in a pair of local referenda. Please take the time to visit the other pages of this site; particularly the Forum Members page where you can see a full list of the members of the forum; a detailed zoomable map of the Neighbourhood Area; and the Feedback page where you can tell us about planning priorities you think Spitalfields should have. 1. The Vision Statement has been written and a series of eight planning ‘Objectives’ have been agreed. The work on the final stage will soon begin. This will start by working out a schedule of activities followed by the formation of specific working groups to work on drafting policies to meet the the planning objectives. 2. Phase 1 of our Public Consultation came to an end on 31st March 2018. This phase was designed to gauge the "needs and priorities" of the neighbourhood and included an online quantitative consultation exercise, the results of which can be seen HERE. There has also been a series of intensive exercises to gain detailed qualitative information from key local stakeholders and interests groups. Alongside these initiatives to find out what people think, we have also been digging into the 'primary data' generated by the Office for National Statistics through the National Census and surveying initiatives undertaken by the Local Planning Authority (Tower Hamlets). All this initiatives have all taken place concurrently during Phase 1. We are aiming to launch Phase 2 of our consultations in October 2018. Between April and October we intend to analyse all the data we have received and use it to draft a series of policy proposals which we consider to be well supported by our Phase 1 data. A bi-lingual leaflet informing residents and workers about our consultations was posted to every address in the neighbourhood in July 2017. 3. Commissioned The East London Citizens Organization (TELCO) in conjunction with geography undergraduates from Queen Mary University of London (QMUL) to undertake a programme of surveying residents and workers in Spitalfields and gauge their views about the neighbourhood area to complement our first round of Public Consultations mainly taking place online through our website. This survey by TELCO is mainly targeted at harder to reach communities to ensure we have a broad demographic base to our data. This work ended in February 2018. 4. At the General Meeting held on Monday 24 April 2017 the first round of public consultations was launched. The Open Spaces Working Group (a subcommittee of the forum defined in our constitution) has developed an online questionnaire which it will soon roll out. This questionnaire will gauge the opinions of local people on our open spaces and form the basis of consultation data for open spaces. In addition, the working group is investigating the ownership of Allen Gardens with a view to registering this open space as a Town Green. The working group has also joined the Tower Hamlets Open Spaces Forum and participates in their meetings. The History & Urban Heritage Working Group (another subcommittee) has reached out to around forty local, national and international experts on the historic and architectural merits of the area. This was done because early on the history and visual appeal of the area was identified as a priority by local people, visitors and local planning policy. The feedback of this engagement is currently being quantified. Stakeholder Consultations have been ongoing and include all the major business and community stakeholders who have responded to our efforts to engage them. Stakeholder consultation is a continuous process. We have also devised a Project Plan which details the order of the different steps we will be taking. The project plan envisages us being ready for local referenda on a Spitalfields Neighbourhood Plan in 2020. The forum has decided to support the establishment of a Town Council in Spitalfields. There are a core group of activists currently circulating a Community Governance Petition, which they report is now almost complete. It is envisaged that the Town Council would continue the good work of the Forum once our neighbourhood plan has been made. A town council would be well placed to monitor the neighbourhood plan and help ensure it was fully enforced by Tower Hamlets. Spitalfields Neighbourhood Planning Forum (known as Spitalfields Forum) was approved by Tower Hamlets Council on 5th April 2016 as the Neighbourhood Planning Forum for the Spitalfields Neighbourhood Planning Area. The neighbourhood area was officially designated as a Neighbourhood Business Area. The Forum Council worked with Tower Hamlets Council to advise them as formal consultees on their draft revised Local Plan. Our representatives met with planning officers for the borough and provided feedback on their proposals from the earliest stages. Officers from Tower Hamlets attended our Forum Council to formulate a service agreement and other working arrangements between us and them. During this period we devised a Consultation Strategy which was formally endorsed at a General Meeting of the Forum held on 27 October 2015 and later revised. We also made further applications for grant funding from the Department for Communities and Local Government. Neighbourhood Planning Forums are formally constituted, local community associations empowered to take forward neighbourhood planning in areas without parishes. Our area was technically designated as a 'business neighbourhood area' which provides a special status for areas without parishes that are wholly or predominantly business in character. The Forum is administered by an elected council who are bound by a written constitution. We invite you to join us in making Spitalfields an even better place to live, work and do business. The members of the 2015-2016 Forum Council meeting in the parish vestry. For further information about neighbourhood planning is, please read on. What is neighbourhood planning all about and how does it affect me? The Localism Act (2011) introduced new rights and powers to allow local communities to shape new development by coming together to write their own legally-binding planning policies. These locally produced planning policies are called "Neighbourhood Plans" and can be created by two types of body - town and parish councils or 'neighbourhood forums'. 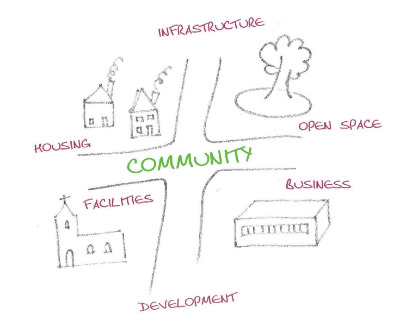 Neighbourhood forums are community groups that are designated by local authorities (e.g. Tower Hamlets) to draft neighbourhood plans in areas without parishes - areas such as ours in Spitalfields. It is the role of the local planning authority (Tower Hamlets) to approve the members of a prospective neighbourhood forum and approve it's neighbourhood area. Once our Forum has agreed on the Neighbourhood Plan the people of Spitalfields who live and work within the specified 'neighbourhood area' covered by the plan would then be asked to approve it in local referendums. Neighbourhood Forums use these new neighbourhood planning powers to establish general planning policies for the development and use of land in their neighbourhood. These are described legally as 'neighbourhood development plans'. Transport and access (including issues around roads, parking, cycling, walking and access for disabled people). The development of schools, places of worship, health facilities, leisure and entertainment facilities, community and youth centres, visitor centres, museums and village halls. The design of new buildings. The height of new buildings. 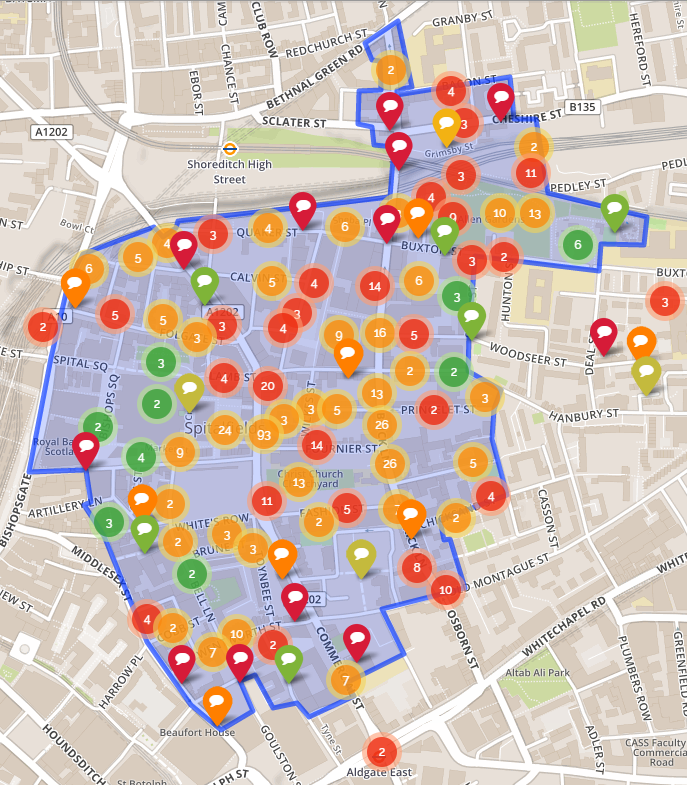 Neighbourhood plans can do a lot and we think Spitalfields would benefit enormously from having one. For more detailed information please read on.